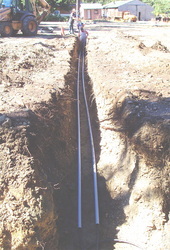 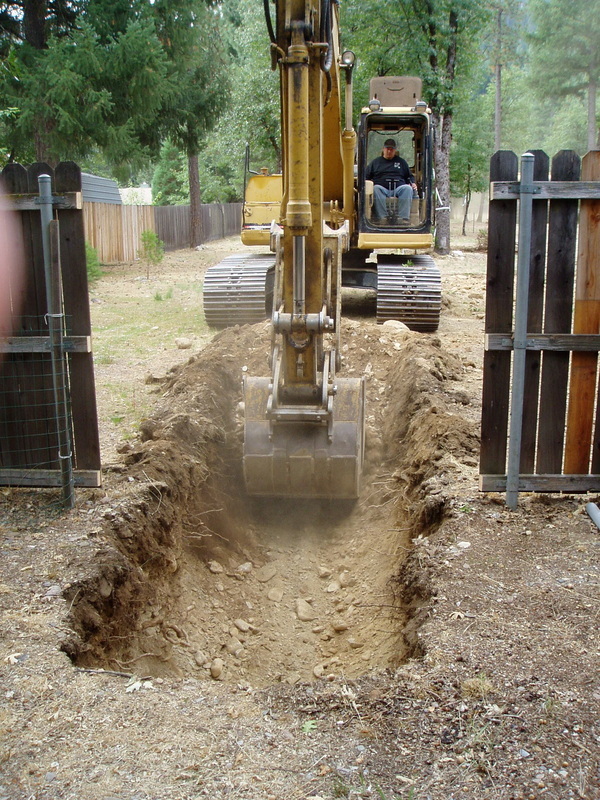 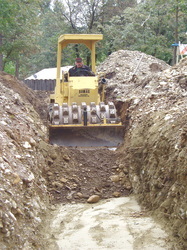 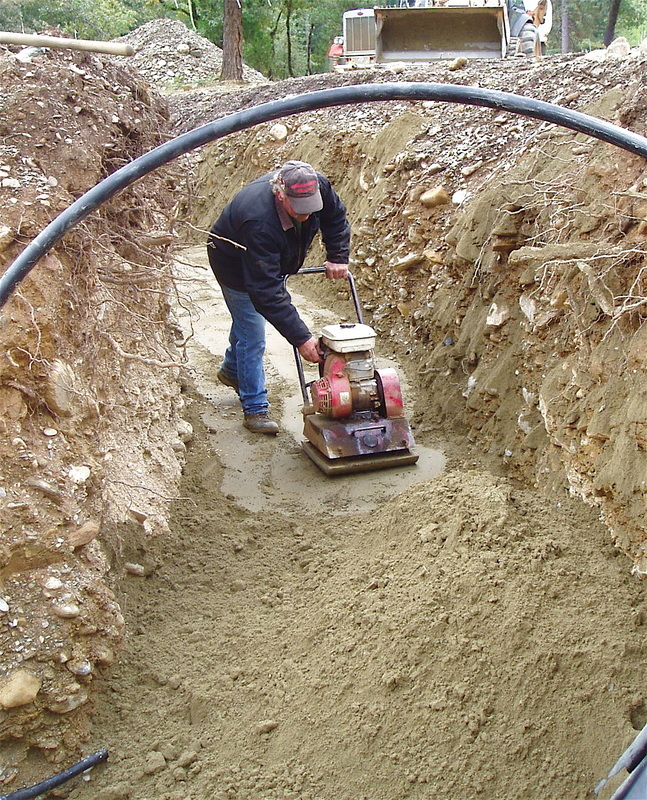 These kinds of closed ground loops are buried horizontally in the earth, either as single or multiple straight-run loops of pipe at varied depths in trenches up to 8 feet deep. 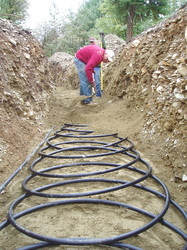 They can also be laid in trenches as "slinky coils" in various pipe densities per lineal foot of trench. 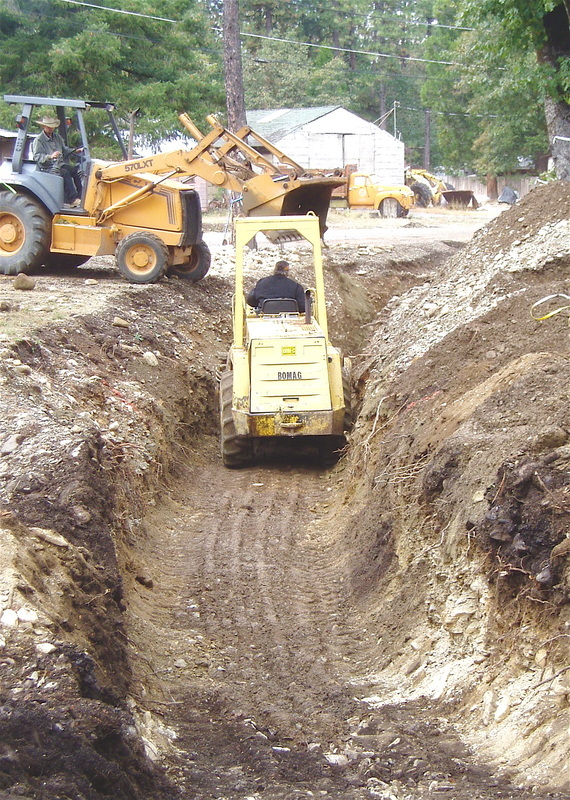 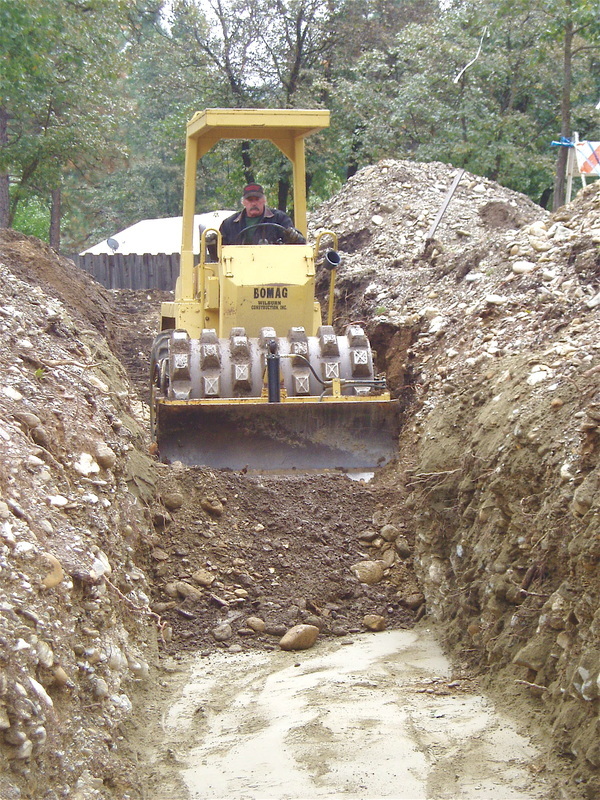 Slinkies are usually laid flat, but can also be deployed vertically where narrow-cut trenching machines are used in optimum soil types where there is no rock. Like vertical bores, the amount of pipe length (and therefore soil contact area) must be critically matched to the heating/cooling load of the building it serves and the characteristics of the heat pump that concentrates/rejects the heat for indoor use. 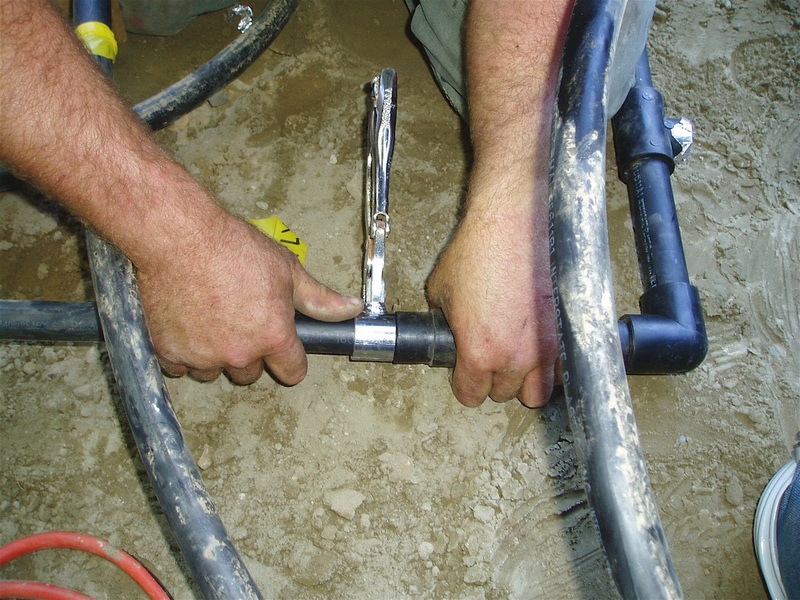 "Rules of thumb" are risky in this line of work, but commonly, 400-600 lineal feet of heat exchange pipe is used per ton of capacity (not counting supply and return headers). 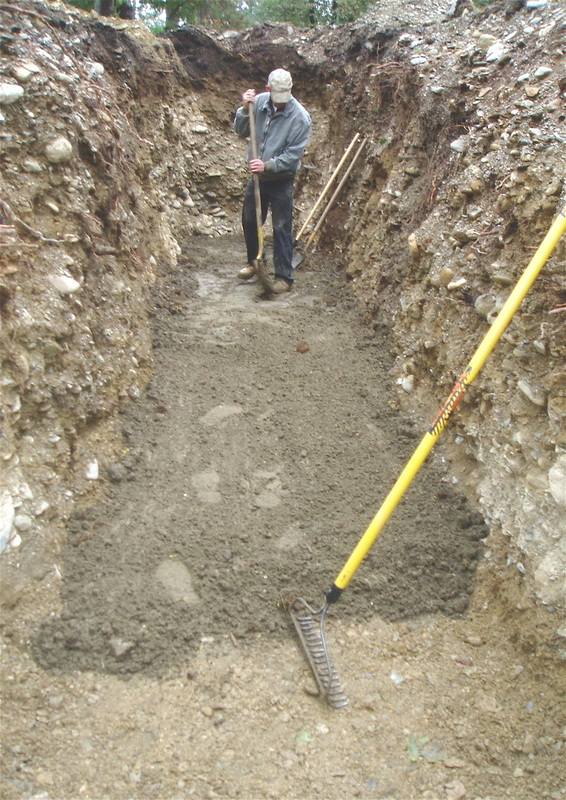 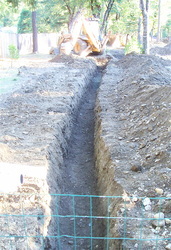 This is the connection between four (now buried) trench loops at the top of the photo with supply and return headers running vertically in the photo. 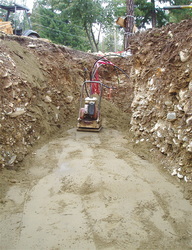 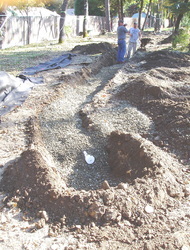 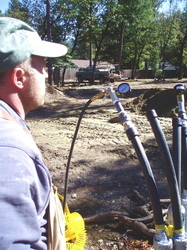 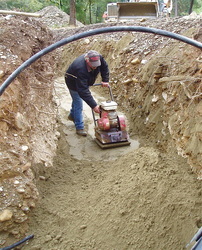 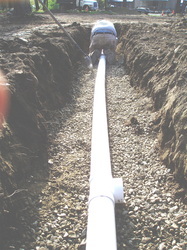 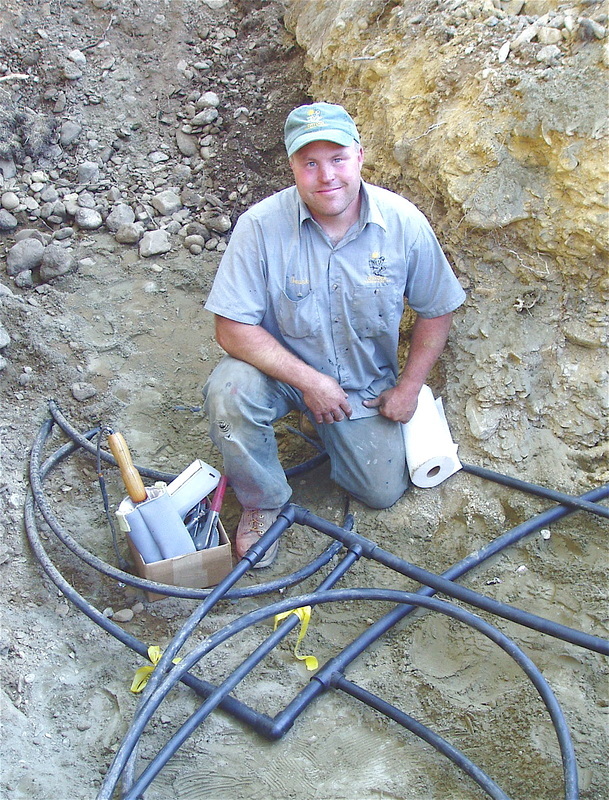 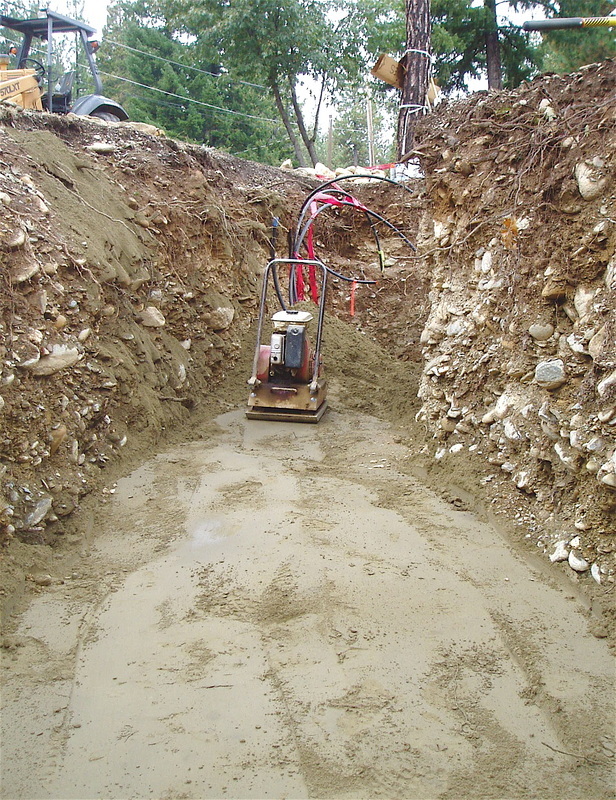 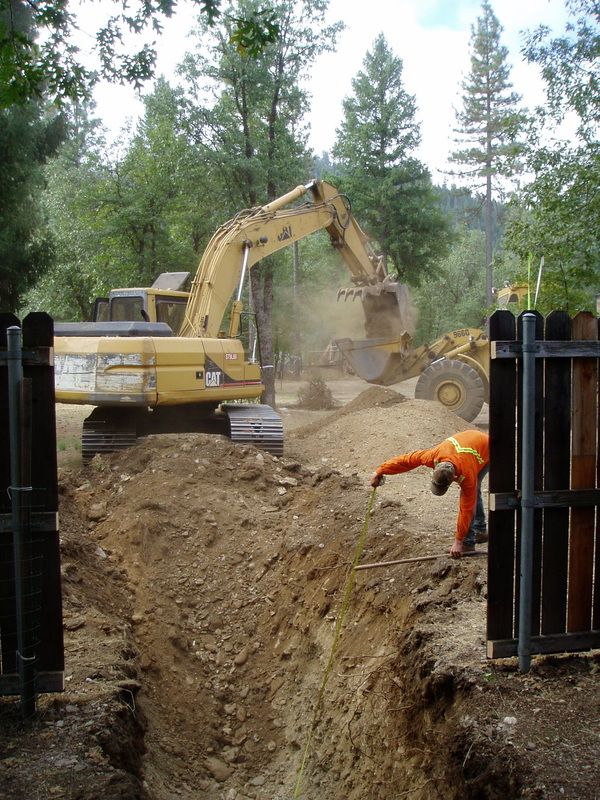 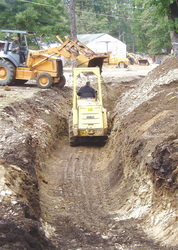 While only two trenches can be seen, these headers connect four supplies and four returns by pipe fusion. 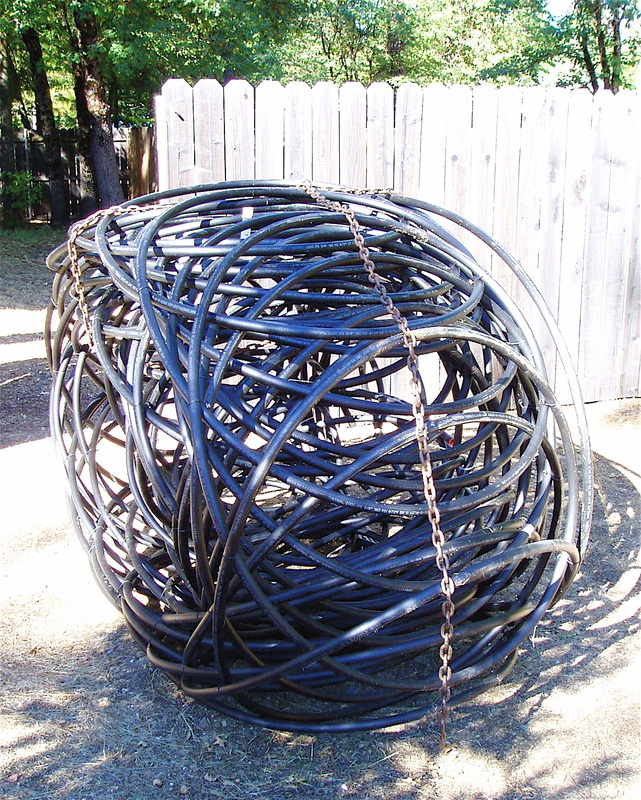 (Clockwise, starting above) A finished slinky coil leaves the jig apparatus with a series of tied, overlapping coils made from a single pipe length. 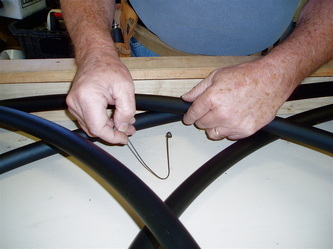 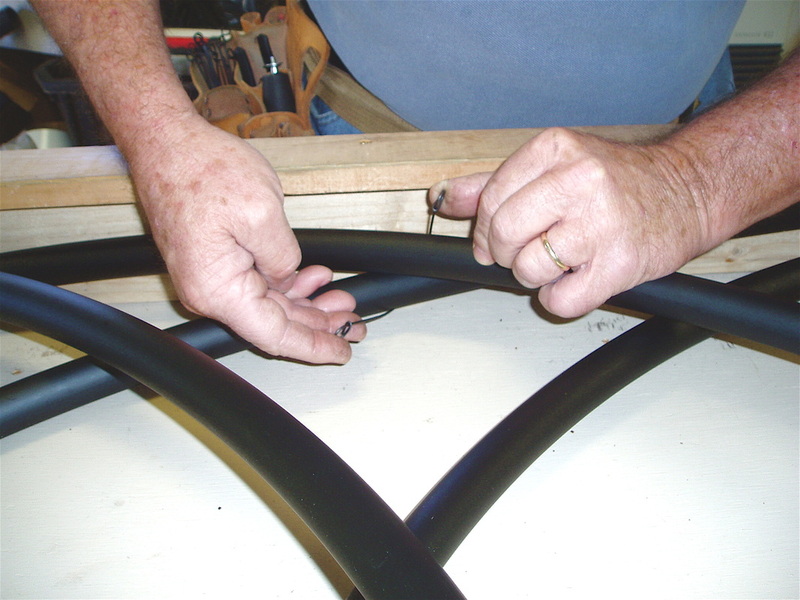 The leftover, large coil will be unwound and tied to the left side of the loops, leading back to the far side of this coil to place the two open ends at the same location. 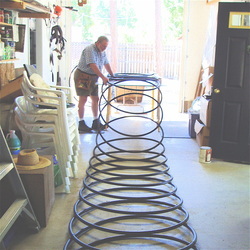 (Above) Slinky loop with a less dense, wide pitch layout. 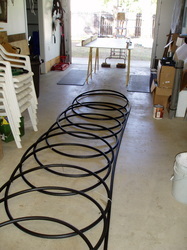 (Below) A Slinky loop with a narrower pitch and greater density per foot. 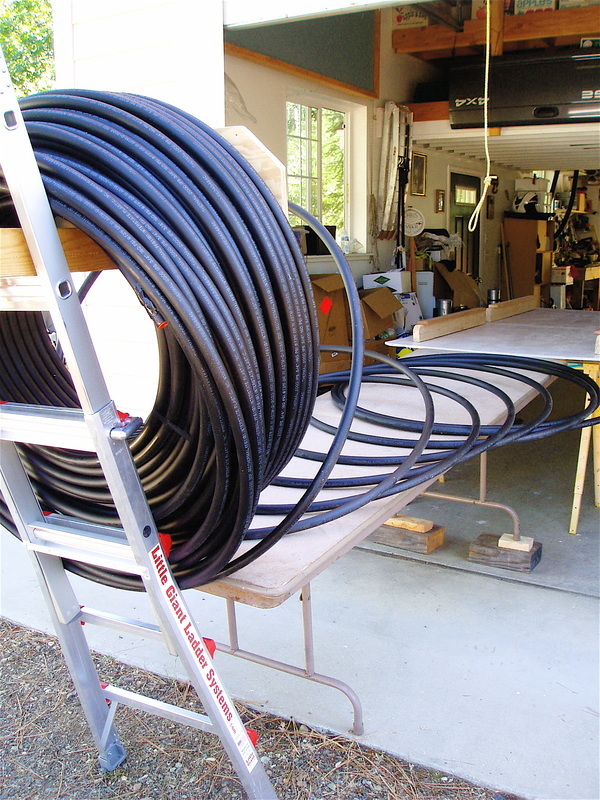 (Above) Slinky supply run on left with straight return run on the right side. 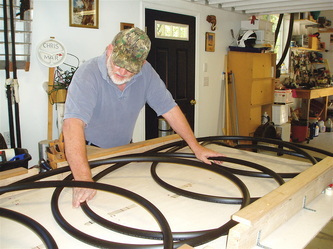 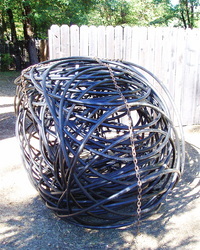 (Above) An adjustable slinky jig, capable of making 24, 30, 36, and 48 inch diameter loops of pipe at varied spacing (pitch) between loops. 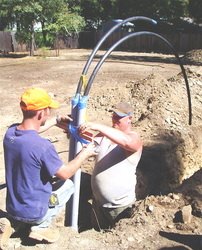 (Left) Adequate pumping rate within ground loop pipe insures a turbulent and not laminar flow. 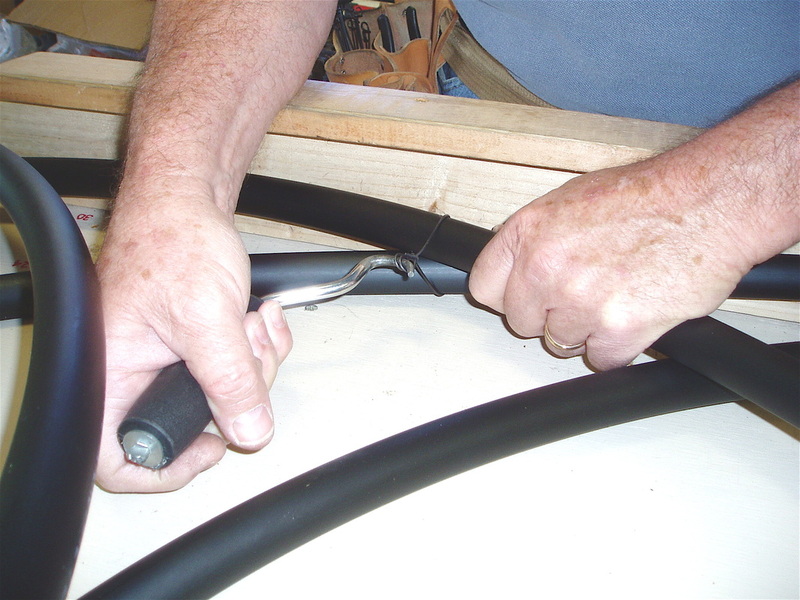 Turbulence is best because it "scrapes" more ground heat from the inside surfaces of the pipe. 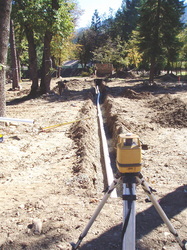 Laminar flow can cause much fluid in the center of the bore to not have much contact with pipe walls. The name of this game is heat exchange, all the way. 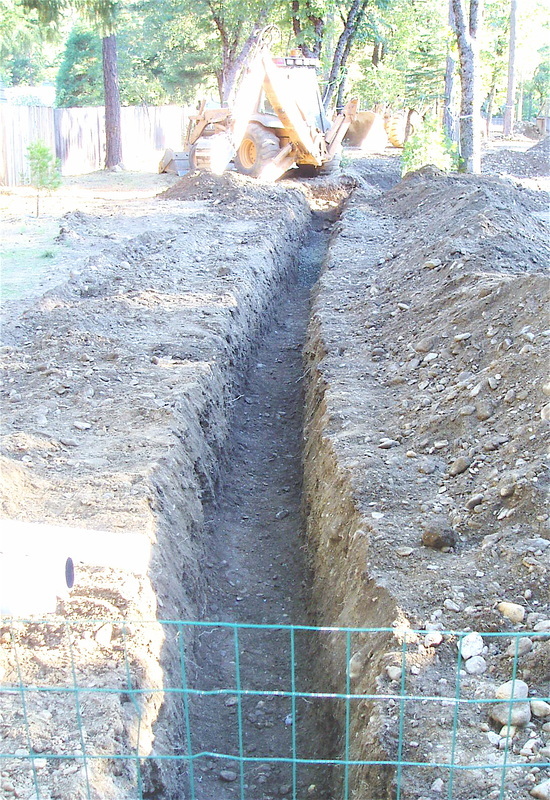 Straight pipe runs in the bottom of a trench (or spaced in layers) are common but your Web host prefers the slinky, where all the pipe is at the trench's greatest depth. 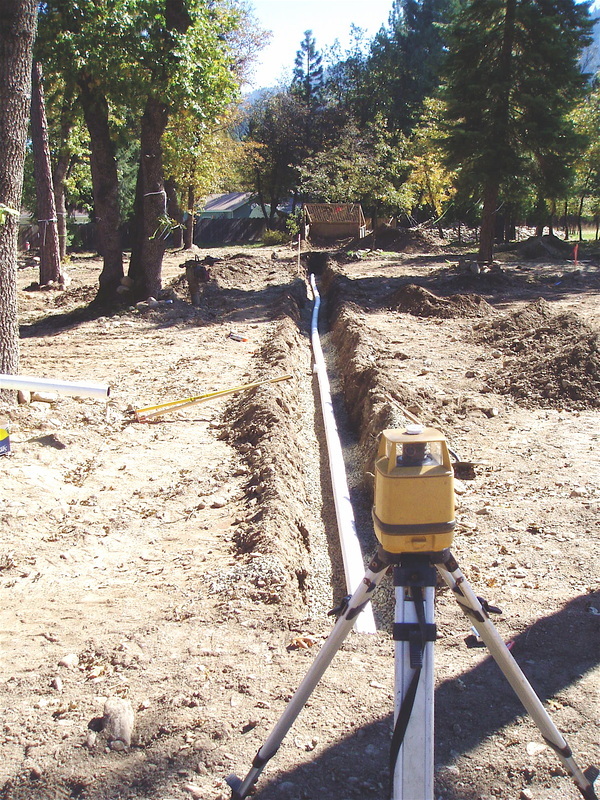 In the illustrated case below, a 36" diameter slinky will provide 9.3 feet of pipe into each lineal foot of trench for greater soil contact and more even pipe spacing than straight pipe runs would. 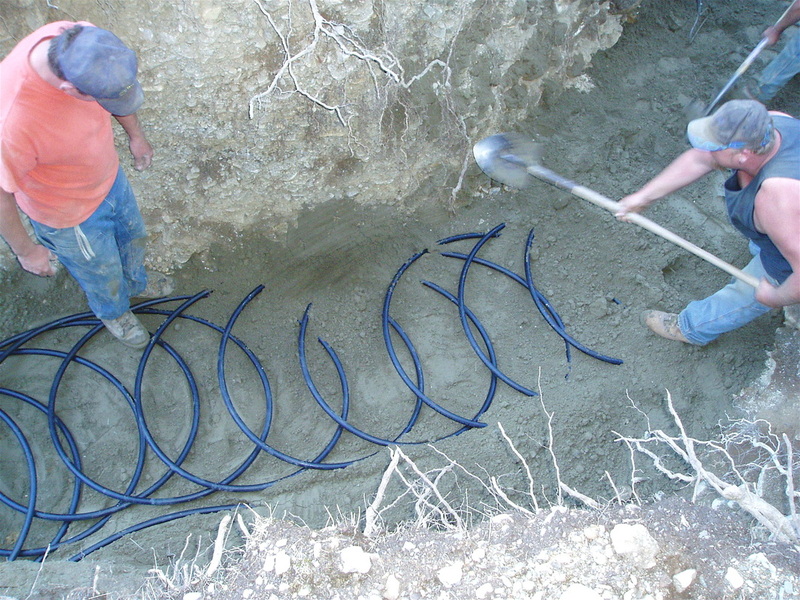 In this case the slinkies were formed from 800-foot coils of 3/4" SDR-11 HDPE pipe. 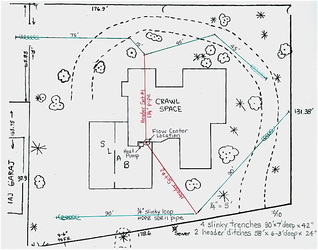 They were pitched at 15" separation, and were placed in an 87-foot long trench at an average depth of 7.5 feet. 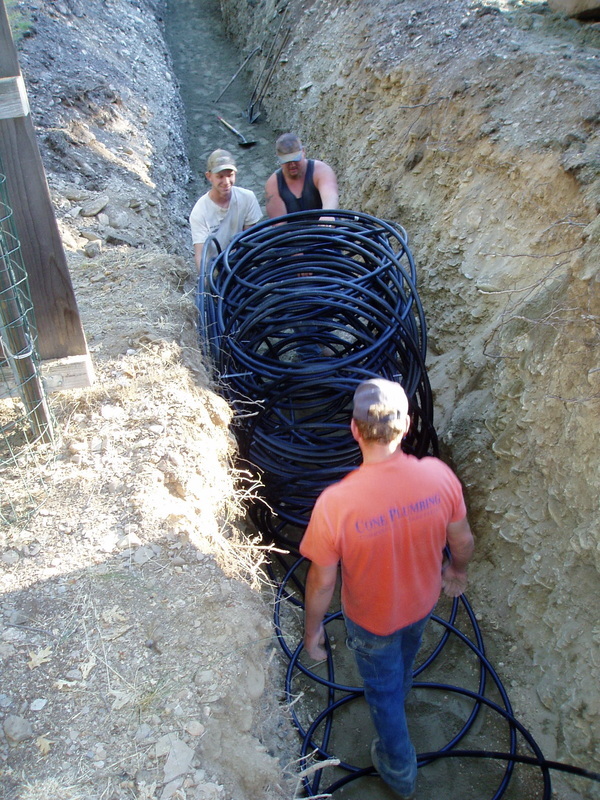 A 3-ton heat pump will be served by 3200 feet of slinky-configured pipe. 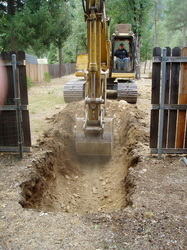 This is your Web host's project in Quincy, California at 3,500' elevation in the northern Sierra Nevada Mountains. 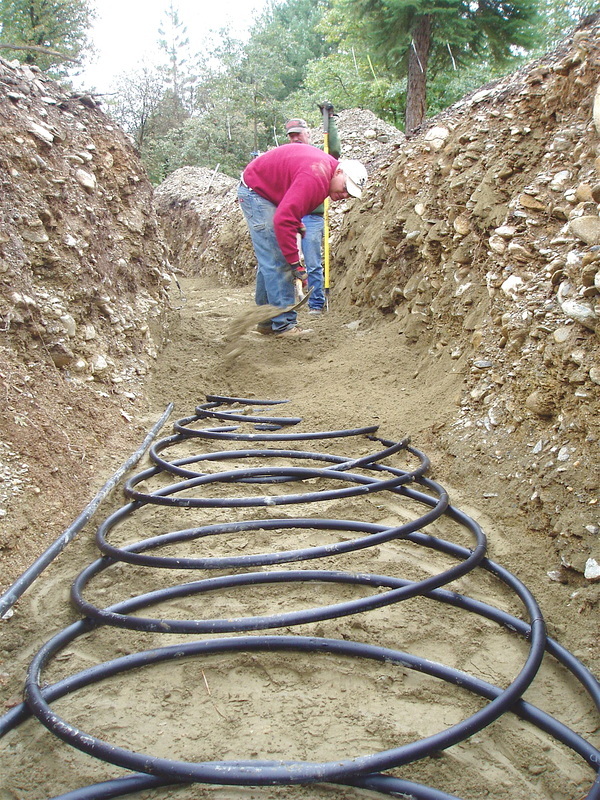 The ground loop trenches meet on the front and rear of the house with two sets of supply and return headers that serve the heat pump unit in the garage. Each of the four trenches is 87 feet long and carries 800 feet of 3/4" SDR-11 HDPE pipe. The slinky supply and return lines meet at the (opposing) trench intersection and are fused to 1" SDR-11 HDPE headers. 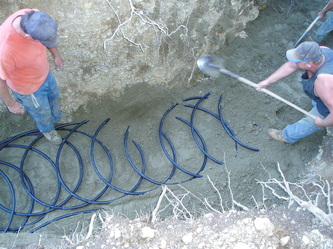 Slinkies and headers must be fused together and then pressure tested before burial. 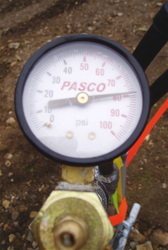 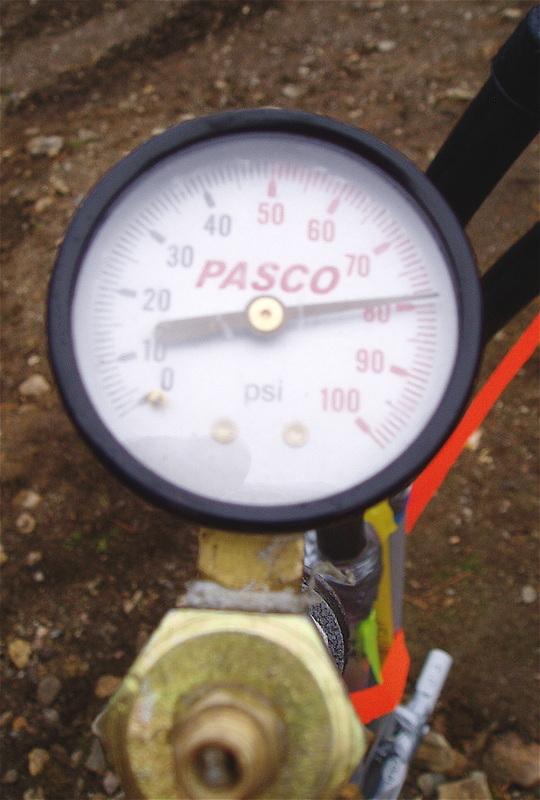 The International Ground Source Heat Pump Association (IGSHPA) calls for pressurizing to three times anticipated operating pressure or 1.5 times the rated pressure of the pipe. Socket fusion was performed here with an iron whose stub and socket fittings were capable of 525°F operating temperature. 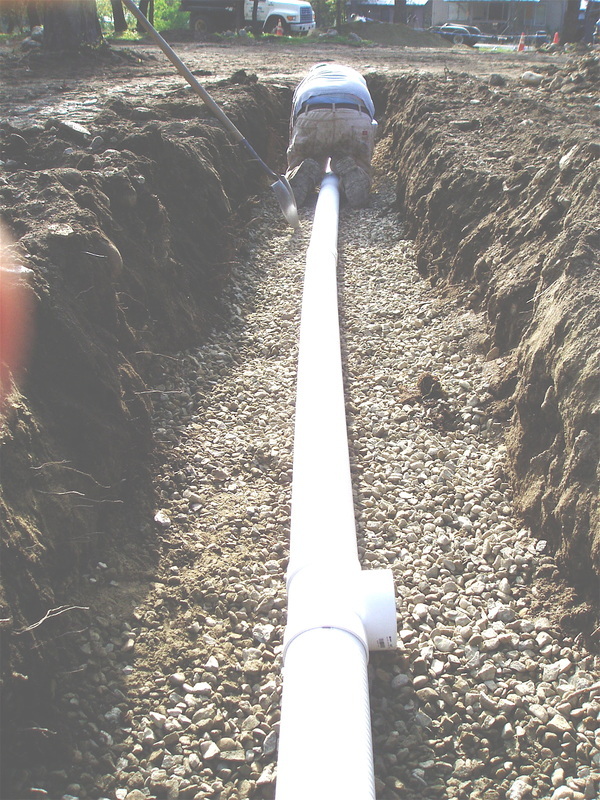 Much of the header pipe was sleeved in 2" schedule 40 electrical conduit due to its passage under crawl spaces, foundation footings, and concrete slabs. 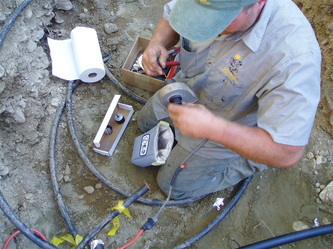 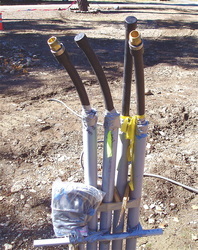 On the header tree can be seen two small conduits with Cat-5 cable inside a plastic bag. 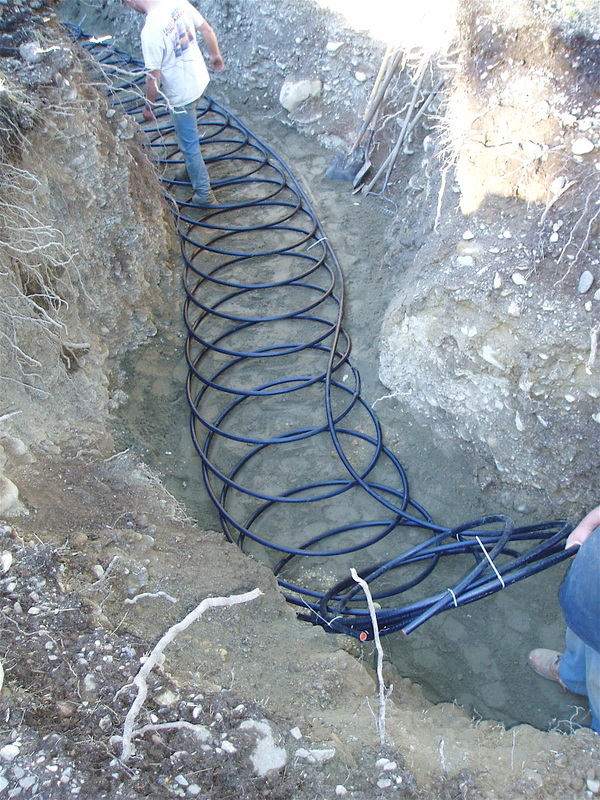 These are soil temperature monitors at the 3-foot and 7.5-foot depths, away from the slinky coils. 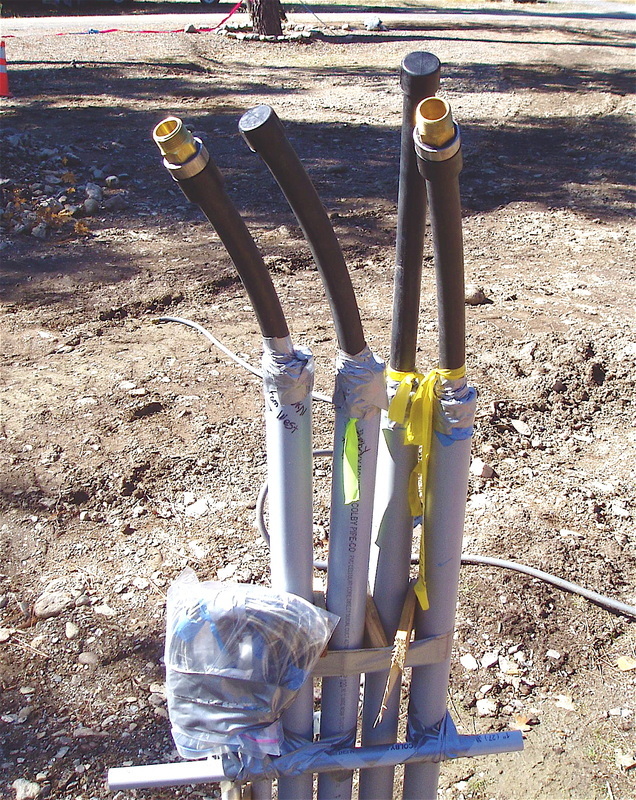 They will be integrated with an Internet-capable WEL (Web Energy Logger) that will analyze and continually post system performance. 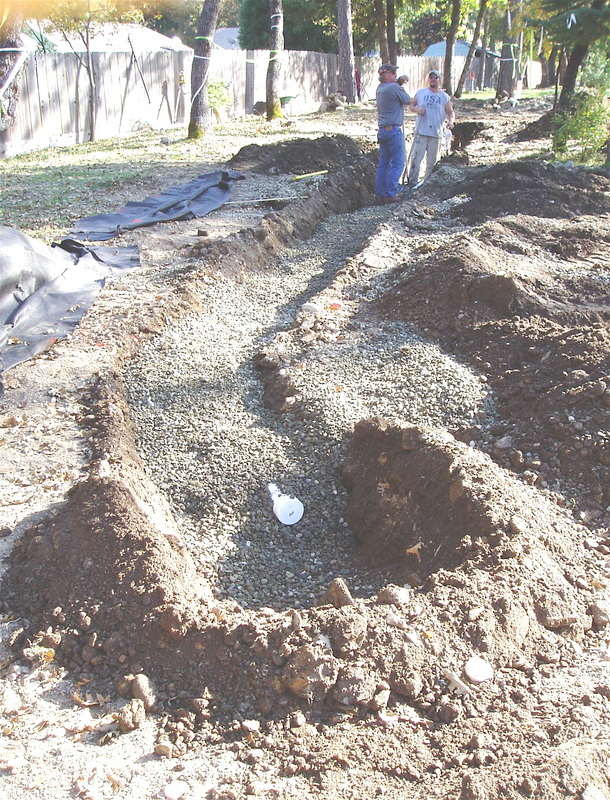 Because the soil in the above location is very poor (excavated spoils through a 4" x 4" screen yielded 50% rock and 50% "soil" with smaller rock throughout) the owner wanted to mitigate what would be poor conduction. 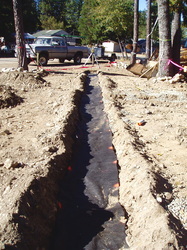 This material stays very dry most of the year. 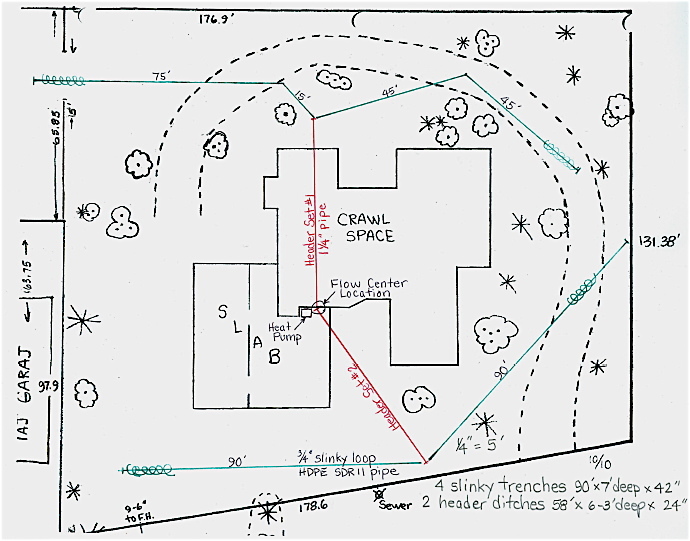 So a high ratio of pipe to tonnage was pursued (1067 feet of ground loop per ton) and a wetting system with leach pipe on drain rock is supplied by all downspout and surface water collected via underground drain boxes with grates. 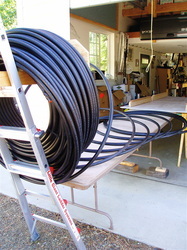 Hopefully, these two extras and the 7.5-foot loop depth will compensate. Often (in warm, cooling-dominated climates) the challenge is to have enough of a heat sink to operate the heat pump in cooling mode most efficiently. Thermal conductivity of the soil and its contact with the ground loop is a primary concern. Lack of a mathmatically derived, engineering approach here can render a large investment in ground loop and HVAC equipment very unsatisfactory, from both a financial and comfort perspective.